This Quantum Stories review appeared in Korean Jazz Magazine MM Jazz in their June 2014 issue. 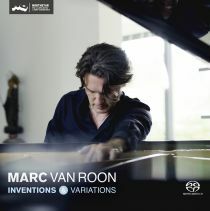 "....Marc van Roon is known in Japan and Korea as the pianist of the European Jazz Trio. On this last recording "Quantum Stories" with the Marc van Roon trio - released last year - there is a stronger tendency towards free jazz, modern and sophisticated music. His musical abilities in classical, free and modern jazz make him, with no doubt, one of the mosy remarkable pianists in the European Jazz scene. He is close to the style of Keith Jarrett and on the other hand close to Esbjorn Svensson trio. He keeps the typical character of the European Jazz music and uses superior phrase dynamic, excellent classical technique, and changeable piano tone. He has an outstanding improvisational skill [...]. Once you listen to this record you will clearly feel that he is an extraordinary pianist. I strongly recommend this record to all the fans of European jazz."